Along with chicken breast and brown rice, sweet potatoes have become a staple of the elite athlete diet. Nowadays, nearly every pro athlete with whom STACK speaks mentions sweet potatoes as a food they eat on a regular basis. The reverence for sweet potatoes is well-deserved, but it has come at the expense of abandoning another type of tuber—white potatoes. White potatoes used to be the default potato on most people’s plates, but they’ve become a casualty of the low-carb craze. Sweet potatoes are lower in carbs and calories than white potatoes, which is why they’re frequently referred to as the smarter option. But is this really true? Is the demotion of the classic white potato deserved? And are sweet potatoes really superior? The answer might surprise you. The following is a segment of an infographic created by Precision Nutrition comparing the nutrition facts of one medium baked white potato and one medium baked sweet potato. Since carbs and calories are the two biggest reasons why sweet potatoes have earned a reputation as the healthier tuber, let’s examine them first. A medium baked sweet potato contains 58 fewer calories and 13 fewer grams of carbohydrates than a medium baked white potato. That’s not a huge difference in the grand scheme of things, but it is significant. Now let’s check out some other big factors. Both kinds of potato have zero grams of fat, which is good. Also, they each contain 3.8 grams of fiber, about 15 percent of your recommended daily value. Fiber is the Swiss Army Knife of nutrients. It helps normalize bowel movements, lower cholesterol levels, control blood sugar and even slow digestion, which keeps you feeling full longer after you eat. The Harvard School of Public Health states that fiber appears to reduce the risk of heart disease, diabetes and cardiovascular disease. 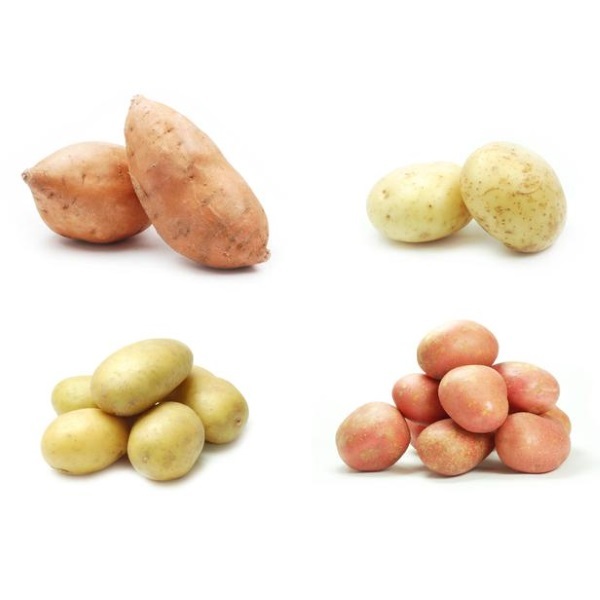 When it comes to protein, white potatoes actually have a slight edge: 4.3 grams to 2.3 grams. Considering the importance of protein for muscle-building and recovery, that’s a big plus. As for vitamin and mineral content, the only category with a big difference is Vitamin A, where sweet potatoes trounce white potatoes. Vitamin A is important for maintaining healthy skin, teeth and soft tissue, so the larger amount of it in sweet potatoes is an advantage. Aside from that, though, the vitamin and mineral content of the two tubers is pretty darn close, with each trading off some narrow victories. Besides Vitamin A, the only real advantage sweet potatoes have over white potatoes is their lower carb count. However, the carbs in potatoes aren’t necessarily the type you should want to cut. Much potato carb content can be attributed to resistant starch, which isn’t digested. Instead, it is fermented in the gut to produce short-chain fatty acids, which aid in nutrient absorption, reduce inflammation, fuel healthy gut bacteria and keep you fuller longer. So even if you’re looking to cut carbs, axing potatoes might not be a smart way to do it. When you add that fact to the higher protein content of white potatoes, you could conclude that white potatoes’ bad rep is not deserved. Both varieties are fat-free, stuffed with fiber and chock full of vitamin and minerals. The bottom line is that both white and sweet potatoes are great foods to include in a well-balanced diet. And don’t forget to eat the skin. That’s where many of the useful nutrients in these tasty tubers can be found. You can find more on this intriguing topic, including the full infographic, from Brian St. Pierre at Precision Nutrition.